While our storytelling can reshape the past and present, occasionally something happens to set events in stone, connecting them to future generations forever, it seems. On a recent visit to Roosevelt Island, a lesser known part of New York City, stones lay nearly everywhere. They covered the shores. Some crumbled in heaps amidst moldering ruins; others graced the island’s tip, marble and bright white. Originally home to the Lenni Lenape tribe, the island first became the pig farm and then the quarantine zone to the city’s residents. 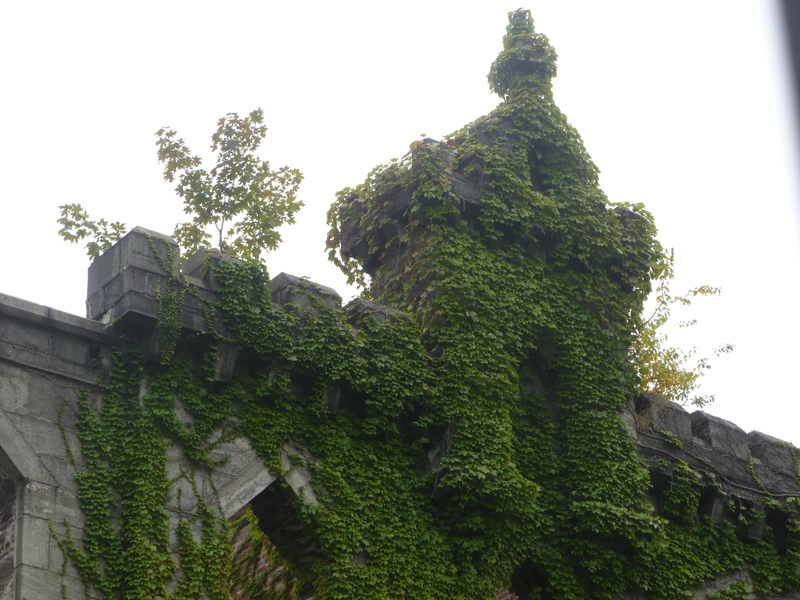 The masonry of the vine-choked walls at the abandoned Smallpox Hospital adheres, barely, as a testament to the days when the wealthy could be drawn to a sanitarium, if it was ornate enough for them. This island, narrow and only two miles in length, lies in the East River that courses alongside New York City. In the 1920s, the place came to be known as “Welfare Island,” site of low income housing. Then that term fell out of favor. Across the river in Manhattan, the United Nations complex rose, inspired in its foundation by what Franklin D. Roosevelt called, in his 1941 State of the Union speech, “four essential freedoms.” These are freedom of speech and self-expression, freedom to worship as one chooses, freedom from want, and freedom from fear. FDR had also served as the governor of New York State, so when the time came in 1973 to find a new moniker for the island, the natural choice was “Roosevelt.” Less natural, and so all the more incredible, is that a buildout of earth and rock should be created to extend the southern tip of the island, putting it on par with the U.N. complex. The architect Louis Kahn designed the grounds and monument to be installed on that extension in memory of Roosevelt. Pick up a book about Kahn written anytime in the four decades that followed, though, and the project is among Kahn’s “unbuilt” works. The linden tree-lined Four Freedoms Park, completed in 2012, features optical illusions along paths that lead to an outdoor “room” of stone, sunlight, and serenity. All this, even though the monument lies exposed to the river and to the cityscapes of Manhattan and Queens. Along the banks of that borough to the east, a red Pepsi-Cola sign is lashed to a row of bleak apartment buildings. There is the certain knowledge that, to the west in Midtown, car horns and sirens call out their warnings. Yet those sounds are muted. The very walls of the memorial encourage tunnel vision: Look to the river, they seem to whisper. For, despite what we humans deem permanent, water will wear down any stone. The haze in the air that day gradually obscured the sights on the opposite banks. It diminished the strength not only of the sun, but also of a busy mind. My thoughts drifted while my body relaxed onto the summer-warmed white marble couch. I gazed off the memorial’s stern right angles and into the river. There, sea gulls huddled on water-smoothed rocks, as if waiting to learn what else we may build of mere stone.